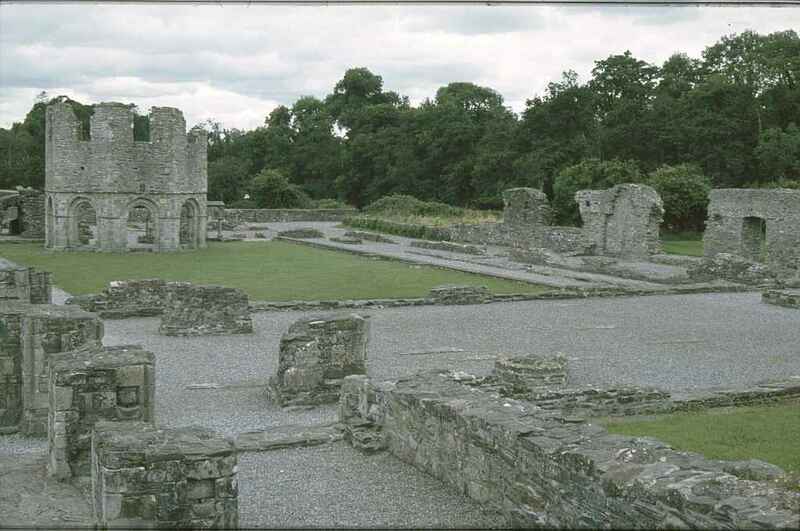 Mellifont Abbey (lat. Honigquelle, westlich der Stadt Drogheda (Droichead Átha)) wurde 1142 gegründet und war das erste Zisterzienser-Kloster Irlands. Seine Lage am Mattock, einem Zufluss des River Boyne, wurde nach dem französischen Mutterkloster in Clairvaux gewählt. Heute sind noch die Überreste des achteckigen Lavabos (Waschhauses) mit seinen romanischen Bögen und Teile des Kreuzganges zu sehen. Mellifont Abbey (lat. honey well, to the west of the town of Drogheda (Droichead Átha)) was founded in 1142 and was the first Cistercian abbey in Ireland. Its location by the Mattock, a tributary of the Boyne River, was inspired by the abbey Clairvaux in France. Today the remains of the octagonal lavabo (washing area) with its Romanesque arches and parts of the cloister are still visible.